It’s not exactly what you’d expect from your coffee shop, but Starbucks has just unveiled a tie-up with Spotify that aims to help you discover new music and influence what’s played in your local store. When you use the Starbucks app at one of 7,500 participating branches in the US, you’ll now be able to discover tracks being played in-store and add them to your existing Spotify playlists. Every week, Starbucks will highlight emerging and established artists for you to check out, as well as offering playlists curated by the wider company, plus its best-loved tracks of the past 20 years. 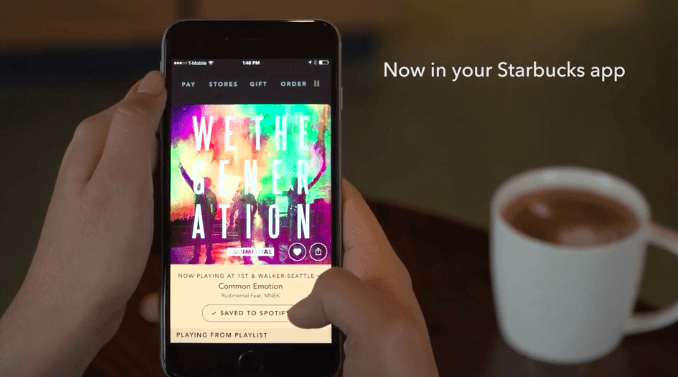 The Starbucks app has been integrated with content streaming hardware from PlayNetwork to enable your smartphone to connect with music playing in store. You can also ‘Love’ songs in the app that you’d like to be added to your local shop’s playlist. Kind of weird, kind of cool?